Creating and managing your account on FetchCFD. 5. Select a username. This will be used for your profile URL. Avoid using your email address as username. Heads up! Once created username cannot be changed. Choose wisely. 3. Enter a valid email address. Important! Double check your email address for typos. 4. Choose a password. Please note that your password must be at least 6 characters long. Important! You must confirm your email before you can publish and download simulations. You can add and edit your user information on Edit Profile. All of this information is displayed on your public profile. - General Info: The name, tagline, email and other information is listed here. You can change/add tagline and profile picture here. But you cannot change your name, username and email address. - Education: Here you can change/add information about your education. - Publications: In this section you can add your publications, reports and other relevant literature. - Work Experience: Add your previous and current work experience in this section. - Specializations: Your specializations and software sills. - Additional Info: Additional information that you may want to share. - Social Links: Link to your personal website or Facebook, LinkedIn, Xing, ResearchGate and Twitter accounts. At FetchCFD everything revolves around community. In addition to the option to comment on simulation projects users can interact with other users through the Message button on their profile and their project pages. Once you click Message, a new window will popup and you'll be asked to enter your message. After completing this form, we will send a FetchMail (email) to the FetchCFD user on your behalf, in this process the contacted person’s email address is not exposed unless contacted person reply. Note: We do not share the FetchCFD recipient's email address when you send them a message via FetchMail. This is only revealed if the FetchCFD recipient replies to the FetchMail message. You can track your favorite users activities by following them. You can follow a user from his or her profile, or any project page. You will be notified on your FetchFeed (account's feed) whenever they upload new (public) projects. To change your password, go to the Change Password page. Enter your current password and the new password twice, then click submit button. Your password must be at least 6 characters long. If you've forgotten your password, make sure you're logged out and go to https://fetchcfd.com/forgot-password. Enter the email address associated with your account and click submit button. A new password will be emailed to you. Please be patient as this may take several minutes to arrive. If you have any issues, please contact us at contact@fetchcfd.com. Make sure you clear your browser cache and cookies before trying the new password. 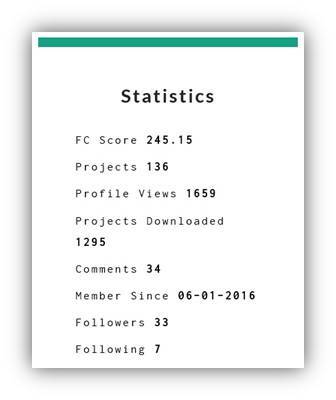 FetchCFD provides a user rating system, called FC Score, which is based on the user activity and feedback of the FetchCFD community. The more you contribute in terms of uploading projects, giving positive feedback on community member projects, the higher your score will be. So performing these tasks will not only improve your FC Score but will also help you get the most out of the FetchCFD Community! To delete your account, go to your Edit Profile page, press Delete Account at the lower right corner, and follow the prompts. It may take a few minutes to complete the process. Important! If you delete your account, all projects, comments, and other site data will be lost forever and cannot be recovered. We will never share your email address and other private information with anyone. FetchCFD respects your intellectual property and do our very best to protect your work. To add an extra layer of security to your projects, you can use FetchCFD Premium - this way you can make your projects password-protected and even get to store your data on your own servers or server of your choice. For more information on FetchCFD Premium contact us at premium@fetchcfd.biz. To report a simulation or a project for abuse or copyright infringement, contact us at contact@fetchcfd.com. Please include a link to the project in question and any other relevant information. We'll do our best to resolve the issue as quickly as possible. Someone is using your work without proper attribution? First, try contacting them directly and asking them to credit you, you can try pointing them to this page as well. If that doesn’t work, you can contact us and we'll do our best to resolve the issue as quickly as possible. Please include a link to the project in dispute and any other relevant information.